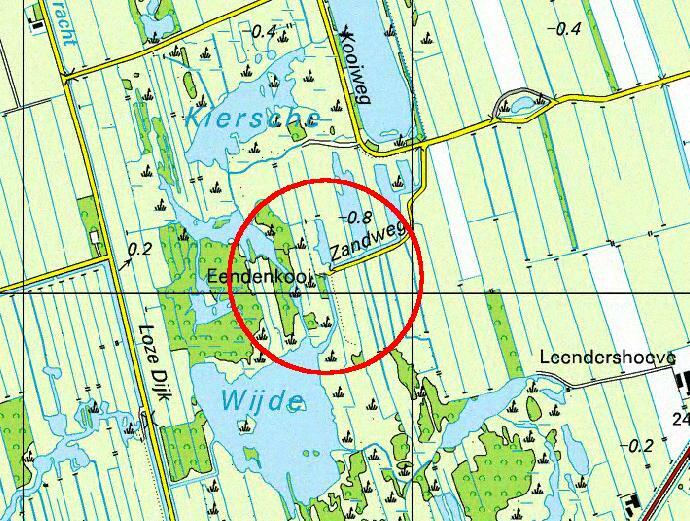 The observationpoint were I have been counting for several years (only in autumns) was located at the west-side of the nature reserve De Wieden in the province Overijssel The village Meppel is located two kilometers to the east. I started on this location in the autumn of 1994 with regular earlymorning counts. I stopped counting here in september 2002 after 366 Early Morning Countings in the last nine years. On the picture below you have a closer look at the map. I have been counting at the end of the road "Zandweg". Birds with the size of a thrush can easily be seen (when they don't fly to high) within this cirkel. Here a view of the landscape around me, photo's were made on 17th febr 2002. Below you can download "spreadsheets" in *.pdf of all the birdnumbers I have been counting in the Early Morning Countings. Halfway september 2002 I moved to Zutphen were I continued my countings (of course) at a new location.